Uzbeks love football and the country invests heavily in the training of school-age boys and girls as well as its top teams. In September 2012 a new stadium, Bunyodkor, holding 34,000 people, was inaugurated. The stadium was designed by GMP Architekten, Germany, a firm that has designed several world-class stadiums, including Warsaw, Kiev and Shenzen. It is a dramatic addition to Tashkent's architectural landscape. Football started in Uzbekistan in 1912, i.e., in Tsarist times, in Kokand and Ferghana. In 1926 the first championship of the Uzbek SSR was played. 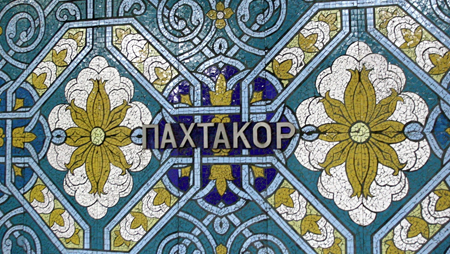 The most successful club in the Soviet period was FC Pakhtakor, the only Uzbek football club that played in the USSR Top League. (Pakhtakor means cotton picker and the Pakhator metro station in Tashkent has splendid mosaics of stylised cotton flowers). Berador Adburaimov, who played for FC Pakhtakor, is regarded as one of the best strikers and greatest football players in the history of Uzbek football. Shortly after independence, Uzbekistan won the 1994 Asian Games tournament in its debut appearance. 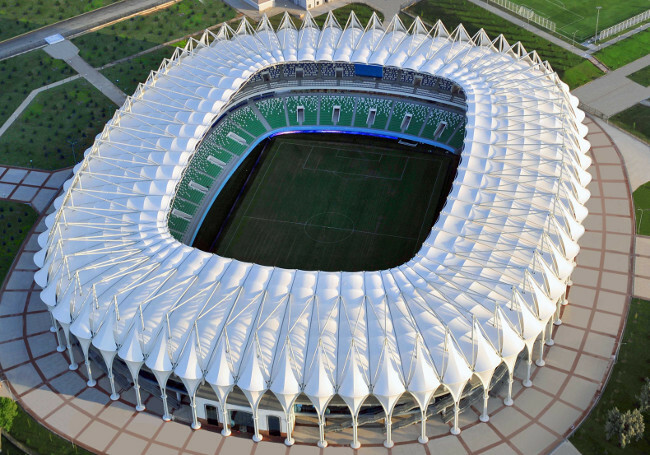 The Uzbek Football Federation has built stadiums, academies and reformed team training and the national championship. The results of this large investment in youth football training as well as the sport's infrastructure are paying off. In 2012 the Uzbek team won the Asian Football Federation's under 16 championship against Japan. Uzbekistan's Amputee Football team has won the World Cup championship three times, most recently defeating Russia in Kaliningrad in 2012. Uzbekistan came up just short in its bid to advance to the final round of the 2012 London Olympics Asian women’s qualifiers. Uzbekistan had been trying to become the first team from Central Asia to reach the World Cup finals. In September they played Jordan in a two-leg playoff, the winner of which would advance to play against the fifth-placed South American side for a place in the finals in Brazil. Sadly, Uzbekistan lost in a penalty shoot out. In May 2013 I visited the new stadium to watch Thailand's Buriram United play Bunyodkor for a quarter-final place in the AFC Champions League. Based on past performance, Bunyodkor was the favourite to take the match. However, despite a raucous crowd, Thailand held the Uzbek team to a goalless draw and secured its place in the next leg. Adding a special Uzbek flavour to the match were mascots dressed in traditional Uzbek clothes pumping the crowd to support the local team. On an Uzbek Journeys tour you will certainly have a chance to see the stunning mosaics of the Bakhtakor metro station as well as view the outside of the new Bunyodkor stadium. Some clients, who are keen football fans, have watched matches at one of city's stadiums.